Artist's illustration of NASA's planet-hunting Kepler observatory in space. NASA officials will announce the planet-hunting Kepler space telescope's latest discoveries at a news conference today (May 10). It's unclear what, exactly, Kepler has found; a media advisory about the news conference didn't give any specific clues. You can find out by listening to the 1 p.m. EDT (1700 GMT) briefing live here at Space.com, courtesy of NASA. Charlie Sobeck, Kepler/K2 mission manager at Ames. 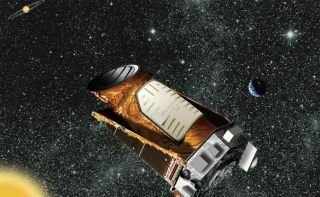 The $600 million Kepler mission launched in March 2009, tasked with determining how common Earth-like planets are throughout the Milky Way galaxy. To date, the observatory has discovered more than 1,000 alien planets, along with another 3,600 planet "candidates," the vast majority of which will eventually be confirmed, according to mission officials. Kepler finds alien worlds by noticing the tiny brightness dips they cause when they cross the faces of their host stars from the telescope's perspective. This "transit" technique requires incredibly precise pointing abilities, which Kepler lost when the second of its four orientation-maintaining reaction wheels failed in May 2013. That failure ended the mission's original planet hunt. However, the Kepler team soon found a way to stabilize the spacecraft using sunlight pressure and the two remaining reaction wheels, and in 2014, Kepler embarked on a new mission called K2. The observatory has continued hunting for exoplanets during K2, though on a more limited scale. Kepler is also studying supernovas, asteroids and a number of other cosmic objects and phenomena in the new mission, which is broken up into a series of 90-day "campaigns."